Handbook of Crystal Growth, 2nd Edition Volume IIIA (Basic Techniques), edited by chemical and biological engineering expert Thomas F. Kuech, presents the underpinning science and technology associated with epitaxial growth as well as highlighting many of the chief and burgeoning areas for epitaxial growth. 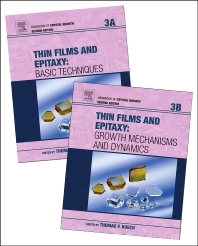 Volume IIIA focuses on major growth techniques which are used both in the scientific investigation of crystal growth processes and commercial development of advanced epitaxial structures. Techniques based on vacuum deposition, vapor phase epitaxy, and liquid and solid phase epitaxy are presented along with new techniques for the development of three-dimensional nano-and micro-structures. Handbook of Crystal Growth, 2nd Edition Volume IIIB (Materials, Processes, and Technology), edited by chemical and biological engineering expert Thomas F. Kuech, describes both specific techniques for epitaxial growth as well as an array of materials-specific growth processes. The volume begins by presenting variations on epitaxial growth process where the kinetic processes are used to develop new types of materials at low temperatures. Optical and physical characterizations of epitaxial films are discussed for both in situ and exit to characterization of epitaxial materials. The remainder of the volume presents both the epitaxial growth processes associated with key technology materials as well as unique structures such as monolayer and two dimensional materials. Provides an introduction to the chief epitaxial growth processes and the underpinning scientific concepts used to understand and develop new processes.